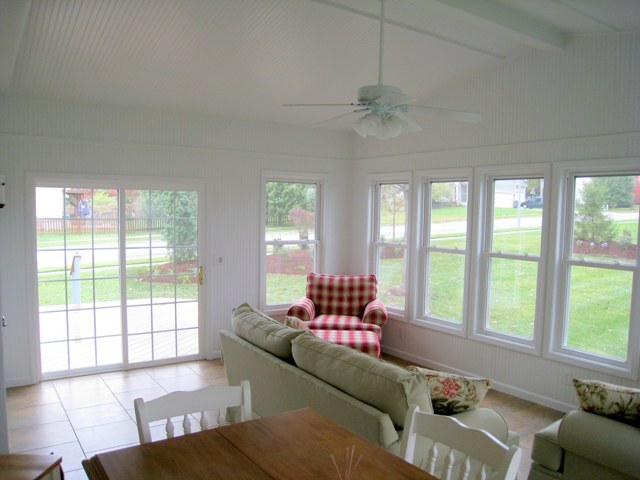 Screened porch or sunroom? Here are some things to consider. Last week, we talked about deciding between a deck or a screened porch. Deciding whether you want a covered structure is one of the first decision. You may already know you want a covered structure or that you want an enclosed room but you may not be sure what’s right for you. The answer can often be found by thinking of all the ways and the most common way you will use the room. Here are some questions for you to consider. Are you focused on being outside in the summer or do you want to be inside but enjoy the brightness of the summer sun? How many months of the year do you plan on using your room? Do you need more room in your house? Are you seeking just the outdoor ambiance in the summer months or more of a full year sort of ambiance? What other activities do you want to do on the porch? Specific activities dictate how the porch is going to be used. Are you going to use the room for parties? Will you put a TV out there? Will the whole family be using the room? Will the kids be using the room? Will you be using the room for adult activities like card parties or book club? You may have heard the terms 3-season and 4 season rooms and you may be wondering about the difference. A 3-season room does not have glass to block wind, nor insulation or heat. Conversely, a 4-season room can also be called a 12-month room. It is really a room addition to your home. If your desire is to have a really bright room with lots of windows, then a 4-season room is probably the best for you. What about privacy? Will you be using the room in early morning for your morning coffee? Will you be using the room in the evening when you may have already changed into your night clothes? In this case, just as in your house, you may want an enclosed room where you can have shades or blinds or another window covering for privacy. Another consideration certainly is price. Screens are cheaper than windows. Insulation and heat make the price substantially higher. There are no exact guideline because there are so many other variables. There will be more of an investment for a 12-month room over a 6-month room. A lot of the finishes and trim items also make the price higher. For example, you can put a hardwood floor in a glassed in enclosure but not in a screened enclosure. Give me a call if you’re considering a new screened porch, sunroom, deck or other back yard extension. (913) 851 – 3325. kansascity@archadeck.net. This entry was posted in Room additions, Screen Porches, Screened porch, Sunrooms, three season rooms and tagged 3-season room Kansas City, 4-seasons room Kansas City, Archadeck of Kansas City, Kansas city screened porch builder, Kansas city sunroom builder, Screen Porches, Sunrooms Kansas City on May 5, 2011 by archadeckkansascity. When is the best time to build a Sunroom? We field a lot of questions about building throughout the year. One of the more common is when is the best time to build my sunroom? People are juggling all kinds of plans and home maintenance issues these days that may conflict with a major building project if not planned correctly. Frequently we hear about people who plan to rework landscaping, repaint their house, or install a new roof at about the same time they plan to build a sunroom or screen porch. All of these projects can cause issues with construction of an outdoor room or porch addition and need care in planning. Proper planning can save both money and time in the building process, depending upon the other projects to be done. It is very important to consider how each type of project may interact with the room or porch project, no matter if it is a screened porch, sunroom, ro0m addition, or three season room. In general with some exceptions, all of the above project types should be scheduled after the outdoor room is completed. In the case of re-roofing, it may very well save money if the roofing job is coordinated with the roofing on the new addition. Landscaping improvements should always be planned after the addition is completed, to fully allow for design of the new room and to minimize damage to any landscaping while building. Additionally here in Kansas City we frequently answer questions about the best time of the year to build. Many consumers are under the impression that outdoor building can only be done in the summer. We usually build 11 months out of the year, and there are some advantages to planning your project in the early spring or late fall. Since the planning and building permit process can take up to 30 days, depending upon the city, it is always wise to allow 30-60 days prior to the actual desired building time when making decisions. In addition heavy rains in the warmer months can actually slow down the building process more than cooler weather does. If you have multiple projects in mind, always consult with your builder about the best sequence for the projects to save time and money. This entry was posted in Decks, porches, Room additions, Screen Porches, Sunrooms, three season rooms and tagged porches, Room additions, Sunrooms on February 25, 2010 by archadeckkansascity. For many years now when the consumer wanted to select a deck building product in wood they had a few simple choices. In Kansas City these choices usually boiled down to cedar or treated pine(also known as CCA or ACQ). Although both of these choices have always been readily available in the marketplace, both woods had some disadvantages in use. In the Kansas City climate with its extremes of temperature and humidity , both products tend to crack or split as they age and are subject to great variations of temperature. This cracking and splitting happens regardless of stain or waterproofing, and can diminish the appeal of an older deck. Recently a new product has been introduced in the marketplace based on long-established European wood technology. This new product is thermally modified wood. In a nutshell the wood goes through a heating process at the manufacturing plant that optimizes its performance in the field. In addition it is processed with a factory applied premium sealant that holds up better to weathering. The thermal modification process is well-proven and has been used in Europe for over 10 years now. As a result of thermal treatment the wood has much less tendency to crack and split, and is very shrink resistant as well. No chemical additives are needed to achieve this result. The thermal treatment process also makes the wood rot and termite resistant. The product also has some “Green” benefits since it uses no chemical treatment and the original trees grow on tree farms here in the US. At present the product goes under two names- PureWood and Radiance wood. This entry was posted in Decks, Screen Porches, Sunrooms and tagged Decks, porches, Thermally modified wood, wood choices on February 5, 2010 by archadeckkansascity. 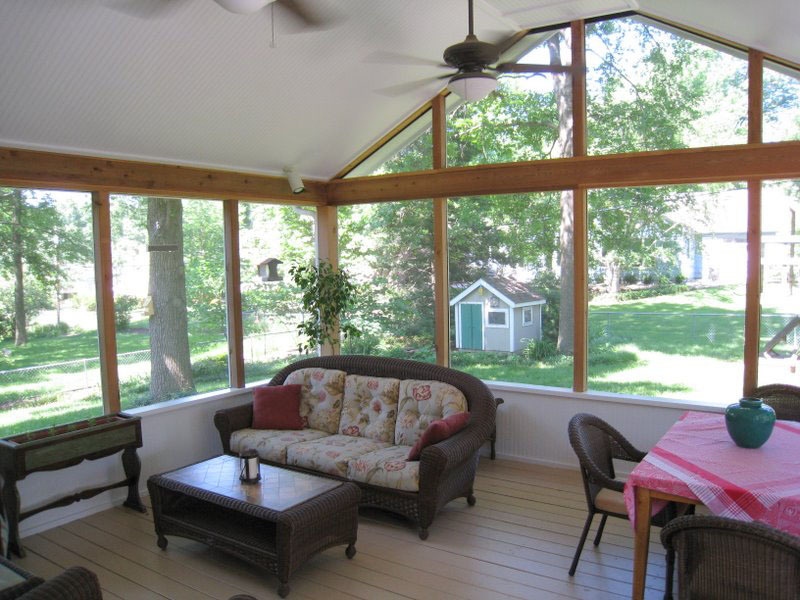 We often run into clients with a great many misconceptions about sunrooms. It seems there is a lot of confusion about the design and construction of a sunroom and what features result in the best performance of the room. The following three questions illustrate some of the important topics. 1. Won’t floor to ceiling windows look the best and perform the best? Floor to ceiling windows usually create more problems than you think. Since they are substantially larger than normal windows they cost more, and by their nature eliminate the “kneewall” underneath the window. This wall serves multiple purposes, including as a space to run electrical wiring and insulation. Any window that is closer than 18″ to the floor needs tempered glass to meet building codes, and this adds even more cost. Generally furniture doesn’t fit well with floor to ceiling windows, and pets may damage the window by scratching it. 2. Should I insulate the ceiling to help keep the heat in? Unless insulation is installed in the full room including floor, ceiling, and walls the value of the insulation is drastically reduced. If the room is used at all in cold weather months it needs 100% insulation, properly installed. 3. I have seen removable windows so I can turn the room into a screen room in the summer? How do these work? Although removable windows are available they have some serious disadvantages. The first disadvantage is size and storage problems. The windows are large and hard to store, and usually there is no suitable place to store them in the room. The second disadvantage is winter air leakage, since no removable window offers the sealing ability of a double pane insulated window. In almost every case the removable windows make the room colder in the winter, and create more problems than they solve. Lastly the single pane removable windows usually cost as much or in many cases more than normal double pane insulated windows with screens. This entry was posted in Screen Porches, Sunrooms, Uncategorized and tagged Sunrooms, three season rooms on January 25, 2010 by archadeckkansascity. In many peoples minds the idea of a sunroom or room addition on their house meshes with how they can use the room. Will it be used only in mild weather, or will it be most valuable to them if it will be used in all seasons and all temperatures? 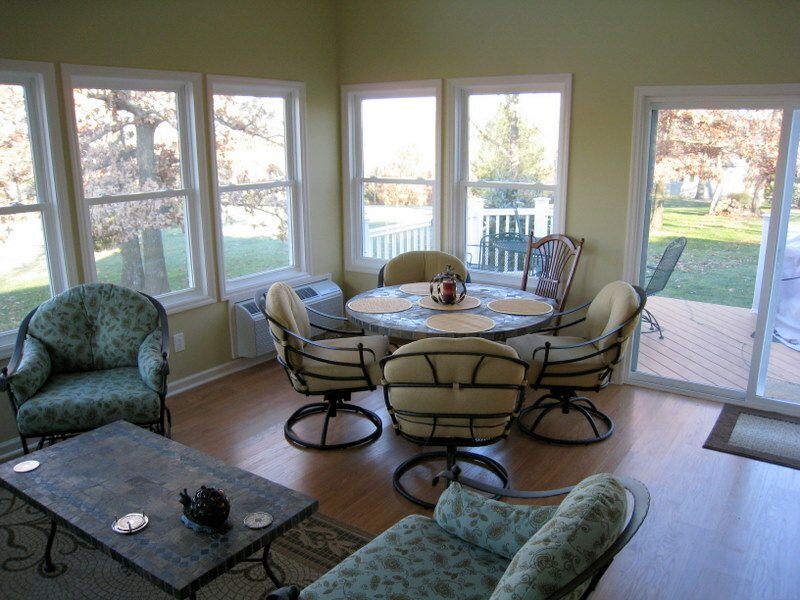 At some point the idea of a sunroom may cross over into a full room addition with multiple functionality. If a homeowner wants all season/all-weather use of the new room addition, then energy efficiency in design and in construction come into the equation very quickly. Wall thickness, insulation type, window type & design, roof overhangs, floor insulation, and remote heating and cooling all interact to impact comfort levels and energy usage. Even if the consumer is not focused on energy efficiency, wide temperature swings impact comfort levels and can make a room less comfortable. In many cases it is difficult and expensive to extend the houses existing hvac ducts to the new room. Even in the case where there is ready access to the existing heating system there is a potential issue if the existing system is adequate to heat and cool the new room. In many cases a remote mounted dedicated hvac unit is the best alternative. Fortunately great improvements have been made in the design of these units in the last decade. Everyone is familiar with the wall mounted air conditioner that is so loud it interrupts your sleep in a hotel or motel. Today similar units combine heating and cooling, are very quiet, and use digital thermostats to allow dedicated temperature control of a room addition or sunroom. This dedicated unit can offer many advantages, not the least of which is the ability to regulate the room temperature independent of the existing home. In addition when the room is not in use it is possible to conserve energy by setting the thermostat to the best temperature for energy efficiency. In many cases the installation cost of such a dedicated unit will be less than extending the existing duct work, and it will work better. If energy efficiency is taken in to account in designing the room, it is possible for the new room to be more energy efficient and comfortable than the rest of the house. This entry was posted in Screen Porches, Sunrooms, Uncategorized and tagged four season rooms, sun porches, Sunrooms, three season rooms on January 6, 2010 by archadeckkansascity. We frequently get a call from a prospective client asking us about adding windowed room for their back yard. In many cases the client is interested in a sunroom that will expand their living space and be usable for 8-12 months out of the year. 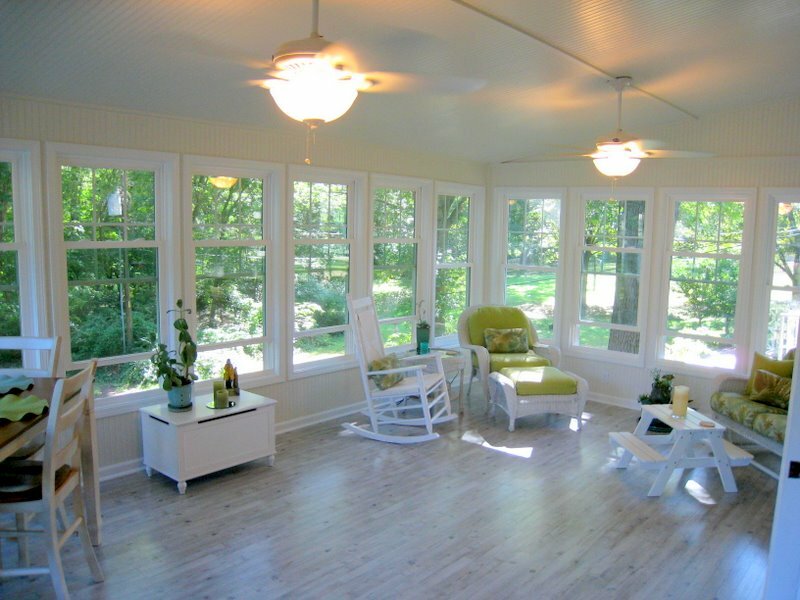 There are, of course many ways to expand living space on a home, but a sunroom is one of the most popular. Frequently the homeowner would like to put this on an existing deck area. Unfortunately, this strategy can lead to all kinds of future problems. Very few decks have been built strongly enough to support a full room and roof weight. We have seen rooms built on existing decks that created innumerable problems with the existing house and the new room. These problems can include sagging, settling of flooring, roof leaks, and jammed doors and windows. In some cases the existing deck can be braced or supported to carry the extra weight of the new room, but in other cases the cost of the bracing, and the difficulty of installing it can exceed the cost of building a new support structure from scratch, especially if the old deck has any rot or structural problems. Since a properly designed and built sunroom enhances a homes value and usability, as well as expanding living space, it is always a good long-term investment to get an expert involved in the structural design, even if you are building it yourself. If you are planning on building it yourself or with a friend, you may want to enlist the help of an architect or licensed engineer to design the structural support. Different types of structural design and support may apply based on conditions such as height, size and shape of room, roof type, and type of house. All of these situations and more need to be taken into account in the load calculations for the room. If you are dealing with a design professional or a licensed and accredited builder, the structural design and support are some of the things you should ask specifically about. If your builder has the proper experience, background, and training in room design he/she should be able to assist you with a permanent, usable solution that will enhance the value and features of your home. This entry was posted in Screen Porches, Sunrooms, Uncategorized and tagged four season rooms, sun porches, Sunrooms, three season rooms on December 18, 2009 by archadeckkansascity.